I find it hard to believe that this is the end of half term and apart from last week, I have looked after our little man every week. It has been a fun journey so far and I look forward to many more adventures in the weeks and months to come. When Alfie thinks of me I want him to think of fun times making ordinary days into adventures and realising that even ordinary days have the potential to make special things happen. Somewhere in the Bible it says, This is the day that the Lord has made, let us rejoice and be glad in it. I like doing that. I bought a slate plaque in an old ironmongers shop in Corwen while we were away last week. It says this. Yesterday is history, tomorrow is a mystery and today is a gift, that’s why we call it the present. Alfie and I were determined to enjoy the gift of this day and enjoy being together. Alfie stayed over as usual last night and I was awakened by the sound of splashing water this morning and I realized that the lady of the house was bathing Alfie preparing him for the day ahead. I was quite taken aback when I walked blearily into the bathroom to clean my teeth to observe that the good lady was actually in the bath with Alfie. The water was up to Alfie’s neck and he was really enjoying the fun. Clearly, the water was not up to the neck of my favoured one and for a moment I didn’t know where to look…but then I thought I’ll be with Alfie all day I can look at him later. It was a pleasant way to start the day. I couldn’t really concentrate on cleaning my teeth properly though. I was given the job of drying Alfie and we had a good little chat while he was practising his grins and smiles. The dear lady then dressed him while I set about preparing her lunch and the boy’s sandwiches. She brought Alfie with her when I took her to work and he was whisked off somewhere to be shown off. We set out on today’s adventure quite late, as I had to visit the dentist and came back with a numb mouth sounding like a hideous drunk, slurring my words. I was hoping the boys in blue would not pull me over, as I am sure I would have been arrested for sounding drunk in charge of a minor. I first had to fill up with petrol. My gauge was showing 2 miles to empty and I thought I might struggle to make St Mellons and back so I called into Tesco. I filled up and then wasn’t sure what to do… rush in and pay and hope no one steals Alfie or take him into the shop and waste time and annoy the boy with the constant in and out of his car seat. I thought I had it all worked out. I parked at the nearest pump and when I went to pay I walked backwards to the pay desk, not letting him out of my sight. Well, I tripped over the step and found it impossible to open the door of the pay desk with my hands fishing behind my back, so I gave up and went back to collect Alfie and he came with me to pay. I think I’ll write to Tesco and suggest they organize a crèche so that harassed grampies like me can pay for their fuel while some CRB checked person looks after the kids…can’t see it happening though! The adventure this week had been pre arranged as Alfie’s mum had requested I take him to meet her pupils and teachers in St Mellons. However, I realise that all work (being showed off) and no play make Alfie a dull boy, so I decided that on the way I would continue his Cardiff Education and introduce him to an important – maybe the most important – part of what he needs to know about this great city and we visited Paget Street in Grangetown, home of the world famous Clarks Pie. The shop was busy this morning and there was a queue almost to the door. The smell of that shop is captivating, much like the smell of a bar must be to a drunkard. I gazed lovingly at Frank Hennessey’s picture on the wall while I waited to be served. My turn came and I ordered two pies one hot and one cold. I didn’t buy one for the boy, I don’t want him to grow up into a boy that people could look at and say…Alfie ate all the pies…he must wait until he is a little; older to enjoy the delights of a Clarksie. The two old birds in the shop loved him though and when I asked for a photograph they both tried to claim they couldn’t use a camera; one dashed off to the window to take a Clarks pie baseball hat from their classy display and both complemented me for raising the boy in such a sensible way. After leaving the shop I took Alfie to show him some of the places where I played as a child when I visited my nan’s house. 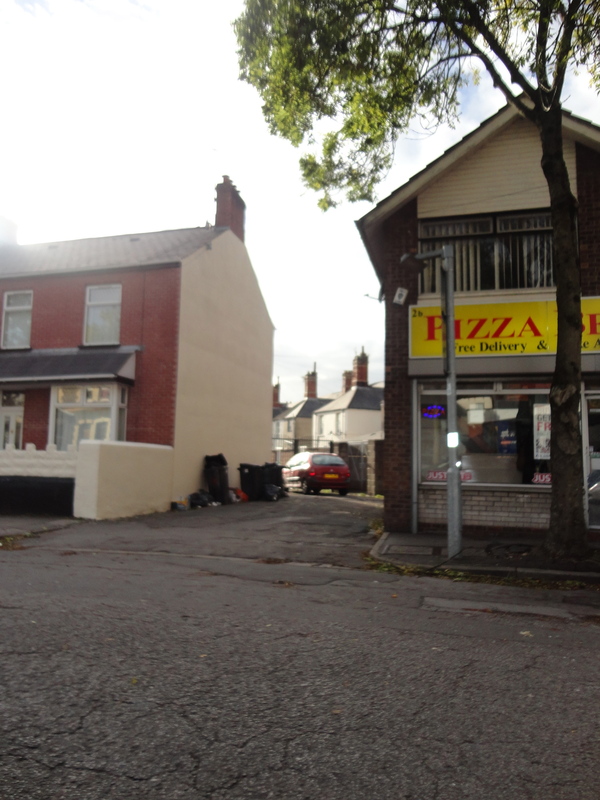 I also showed him the house where I was born…no brass plaque on the wall for me though, just loads of happy memories. My nan was great. Then we drove to St Mellons and the smell was wonderful. I don’t know why so may drivers waste money on expensive car air fresheners…all you need is a hot Clarks Pie…. I was in heaven. As I drove up Greenway Road I was faced with a dilemma. Alfie had obviously filled his nappy. I couldn’t take him into school smelling like that so I had to change him on the back seat of the car. It was a tricky operation but I think I got away with it and smelling much sweeter now I took him in to be shown off. He was magnificent, smiling in the right places every time. He loved school and the small chairs and toys. Staff and kids alike thought he was wonderful. Alfie and I had agreed to give the cold Clarks pie to the headteacher, thinking that if we treated him well the next promotion might come his mum’s way. Clarks pies have great power…watch this space. The Head was delighted and was halfway through it before we reached the door of the office! I can’t help thinking that it needed more respect, like an old vintage wine …looked at, sniffed for a bit before tasting in very small bites. I was proud of Alfie and proud of his mum too. At the end of lunchtime we popped into his mum’s classroom to meet the children who again adored Alfie. While his mum was addressing the pupils, I took refuge on a nearby metal filing cupboard…bad move! After a while I had this sinking feeling and had visions of me going base over apex in front of these six year olds. I shot up just in time but the cupboard was twisted and dented. I felt terrible mostly because the cupboard was personal property not the property of the council. I left shamefaced and embarrassed, thinking maybe it was me who had eaten too many pies! When I got back to the car and opend the door I gasped, the smell was rank! The old dirty nappy had been fermenting for the last hour and a half. Using Alfie’s coat as a fan I tried to divert some fresh air into the vehicle. When I felt it was safe and hygienic enough, I put Alfie in and followed. Then I saw my Clarks pie on the seat. I was starving. I could resist no longer. I began greedily devouring the pie in between gagging at the smell of the dirty nappy. Such is the power of a Clarks Pie. Today I actually set a personal best and only had one single trickle of gravy down the outside of my coat. I carefully scraped it off and ate it… far too good to waste. I decide to visit Roath Park on the way home. I was keen to show Alfie The Lighthouse at the park, that remarkable reminder of the fact that Scott of The Antarctic left from Cardiff on his last fateful voyage to the South Pole. I parked quite near the lake and took our little man to the very spot where thirty-eight years ago I asked the lady of the house to marry me. At first Alfie looked disinterested but as I explained this was where my adventure with the great lady had begun he started smiling and laughing, maybe he understood the significance of this hallowed spot or maybe it was the advancing group of geese and swans!! It was too cold to walk far so we gave the lighthouse a miss and retreated to the car and headed for town. Great Aunt Bes had called with matters of utmost importance, which nothing could get in the way of. Her new phone had arrived and we simply had to meet her in the 3 shop to arrange to pick up a new Nano sim. Absolutely nothing else mattered! I know my place and the importance of such things and in no time at all we were in St David’s shopping centre purchasing the aforementioned article. I noticed Bethany look with disgust as we met, then I remembered the big gravy stain on my coat. Bother!! I looked round for a poppy seller… one of those would cover it! Alfie and I then strolled to M & S to pick up some dollars for his dad’s birthday. Tonight Alfie is off to the USA to visit a friend of his dad and mum’s who is a marine and recently lost both his legs in Afghanistan. They have been collecting money to help Tim convert his car for disabled use… they are such caring people… I hope Alfie grows up to be like them. On the way back to the car we popped into St John’s Church; I was explaining to the boy that this was the church where his great grandfather and great grandmother were married just after the war. It was quiet inside and I got thinking how very sad I am they never saw our little miracle. They always believed God would send him – they totally believed during the years of heartbreak – but they were taken before seeing him. How they would have loved this darling little man. At the back of the church we stopped and lit a candle, it seemed the right thing to do. All Alfie will have is pictures to look at and the stories we will tell. 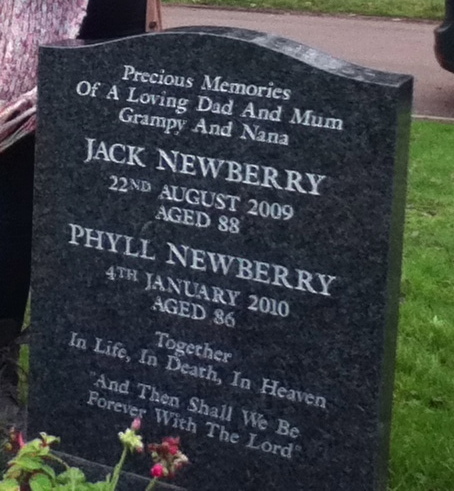 I was blessed I knew them as my dad and mum. We left the candle flickering in the quietness of the church and I wiped away a tear before going back out into the cold. I bought a carton of cockles in Ashton’s before heading back to the car and making our way home. 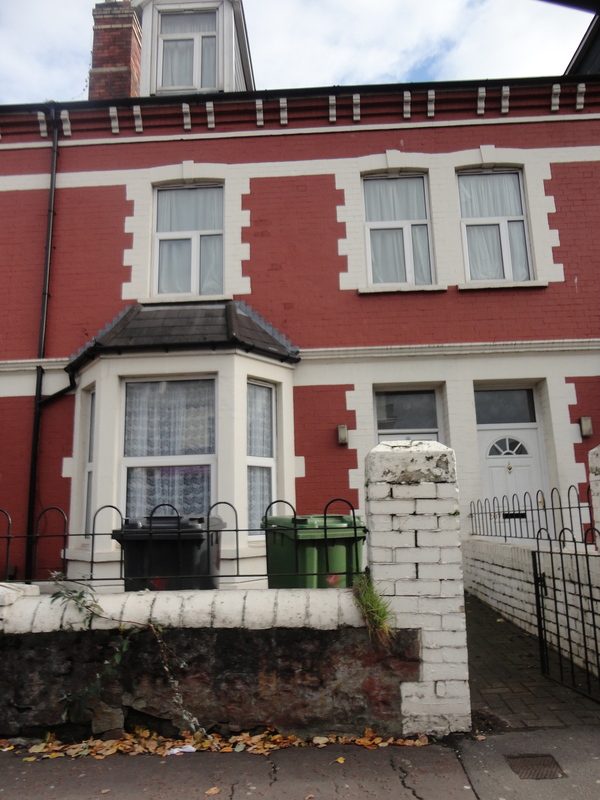 It had been a full day for Alfie and he was asleep before we reached Penarth Road. Later his mum would be collecting him and then they’ll be heading off across the Atlantic. I’ll miss the little fella…. Alfie has promised that he would write to me from America… I am sure he will. 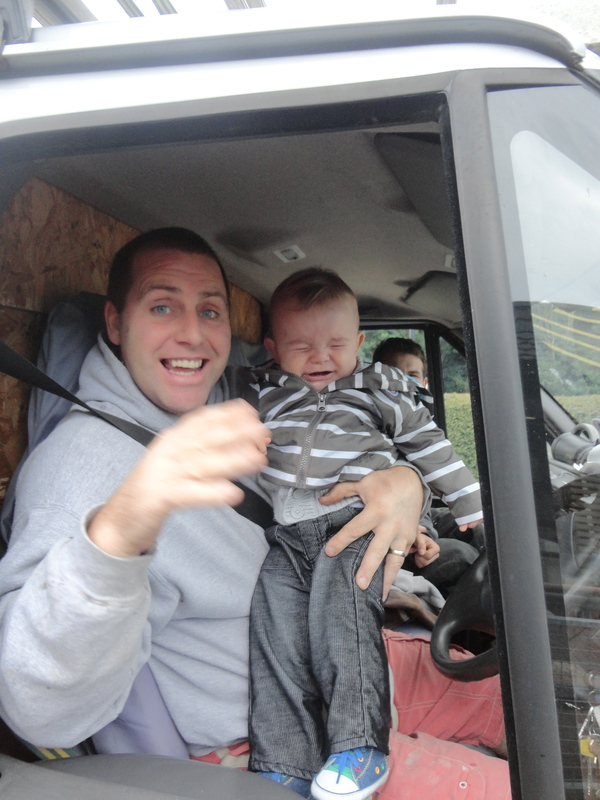 Have fun… go adventuring with your dad and mum my little friend. There was a windy start to the day and then I remembered our visit to the Royal India Restaurant the evening before, it had been our thirty seventh wedding anniversary and I had taken the lady of the house out as a special treat. She had wanted to go to a fancy dress party and had suggested I wear my invisible man costume, but I couldn’t see myself wearing that, so we went out for an Indian instead. We had a wonderful time, the food was quite exquisite, but we had made the mistake of having a starter and neither of us could finish our main course. During the course of the meal, we had both made schoolboy errors, the lady of the house had dribbled quite a large amount of her starter onto the crisp white cloths and had to lean forward to disguise it every time the waiter attended us. 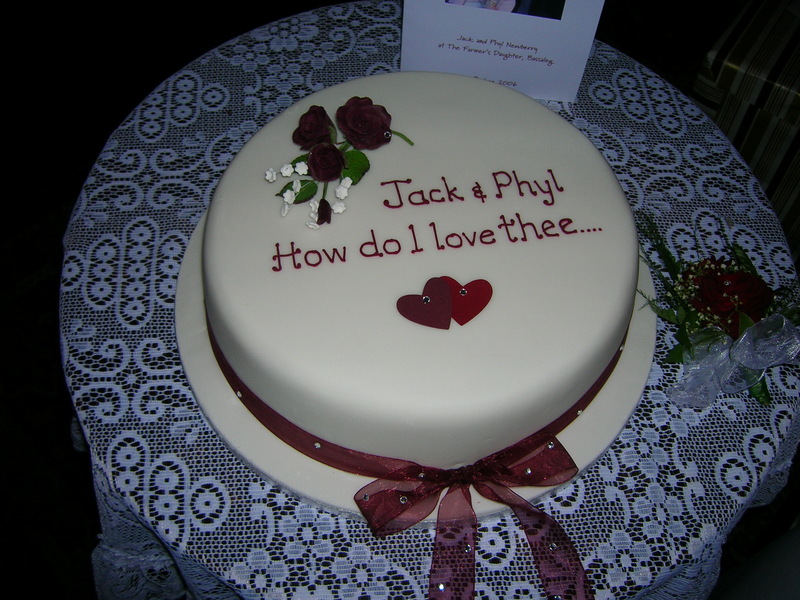 I kept thinking she was looking for a sly anniversary kiss, but each time she did it, my advances were thwarted by a quick ‘Sit down Fatboy, behave yourself!’ from the great lady, who has endured thirty seven years of awful jokes and an overweight spouse. She has put up with so much…poor soul! My mistake was to eat one of the whole green chilies that were decorating my chicken kalapuri. Very bad move! It was like eating a box of England’s Glory all alight at the same time. I smiled as I reflected on a pleasant evening and hoped the wind would die down soon! Anyway I got up and looked out of the window and saw blue sky. St Fagan’s it is then I told myself! Alfie had not slept with us overnight so I settled back into bed, waiting for his mum’s car to drive up Chapel Close. When I heard it, I nudged the snoring Sleeping Beauty beside me and she obediently ran downstairs to meet our little man. Once upon a time, someone actually did compare me and the lady of the house to Beauty and the Beast, but I thought that was most unfair, I know she’s got an almighty growl on her, but my dear one looks nothing like the Beast! How can people even think that! Aunt Bes was in work, so after making breakfast for the dear lady and preparing her lunch I had to bundle Alfie into the car. I quickly had time to throw in the first load of washing; life is tough sometimes, before taking my beloved into work, receiving from her my orders for the day and then drive home, desperately trying to remember all I had been told! Upon my return I gave Alfie his breakfast and we had only a little play together before the pips on the radio heralded nine of the clock and nap time. Having been severely reprimanded last week for his lack of sleep I was determined to redeem myself. Alfie found it hard to settle and on one of my frequent visits to his room I smelt why! 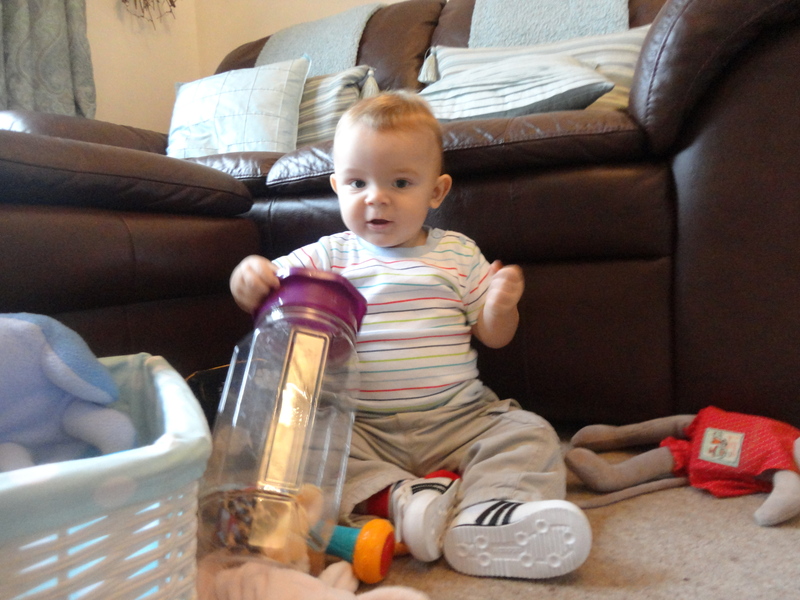 A nappy change took place between putting the first load of washing on the line and the second load into the machine. 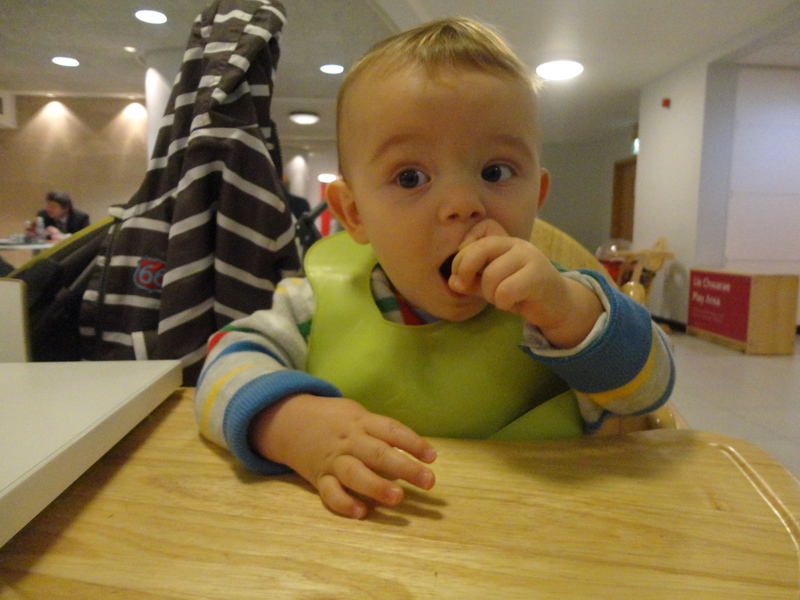 Alfie’s offering reminded me of last evening’s Lamb Korma…what is his mother feeding him? 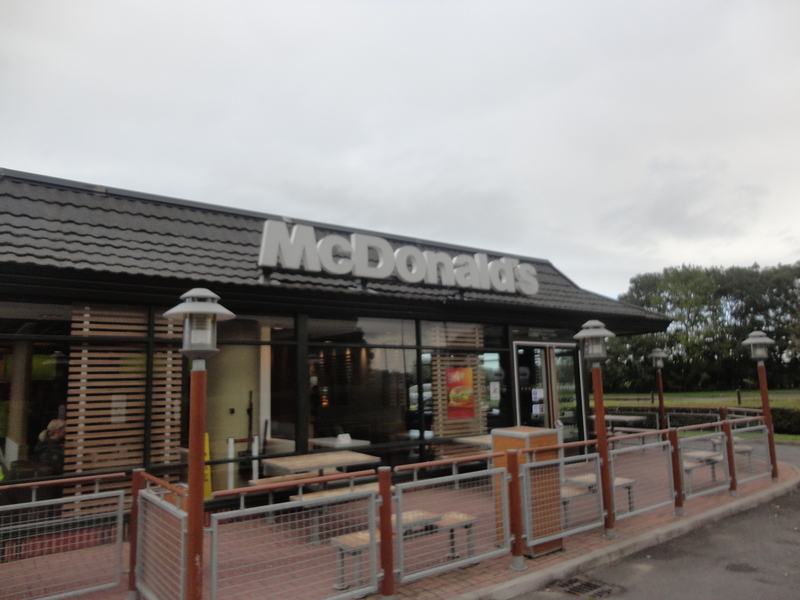 Time was ticking on so I decided to give the rest of the nap a miss and head for our first port of call. I had decided to take Alfie to visit his cousins in Barry. Of all our adventures surely the best must be visiting Mia and Millie, two beautiful little people. I felt a bit off colour and then realized that in seeing to the lady of the house and Alfie, I had not had any breakfast or even a drink. What was I to do? Suddenly the answer was staring me in the face. I leaned back and Alfie seemed to nod in agreement. Bliss! Alfie was still full from his Weetabix and mashed banana, so he didn’t fancy one. I thought I would buy a breakfast for Mia and Millie’s dad. He’s has a rough time lately, a little problem with the Crown Jewels. They’ve been playing up a bit and still causing more than a little discomfort… but forget cocodomol, paracetamol and antibiotics, what the boy needs is an Egg and Sausage Mcmuffin Breakfast. Fix any part of your body in no time!! I ate mine and we made our way to the exit. As we did so we were nearly run down by a pair of rough looking builders in a rough looking van. The hoots and the waves though, revealed one David Brown, a distant relative of Alfie’s with his sidekick Alfie’s Uncle Pete. Dave was tucking into a breakfast wrap and at the same time trying to negotiate his way around the car park. I gave him Alfie for a cuddle but perhaps his hands were a bit rough but I am not sure Alfie enjoyed it. We exchanged pleasantries before making our way to Afal Sur. Mia and Millie were delighted to see us and we all had such fun playing together. Mia and Millie are so lovely and I know Mia has a big responsibility of being a big sister and big cousin but I am sure she is ready for the role! After a while we left Barry creeping along the A4050, as some time earlier the petrol gauge in my car told me 0 miles till empty. I guessed the car was quite light now with very little petrol in it so I hoped we would make Tesco and we did…just! I paid with my plastic passport to Paradise (otherwise known as a credit card!) and we made our way to Saint Fagan’s. On the way I called into Western Cemetery, I wanted to show Alfie my grandparent’s grave. They were such lovely people. 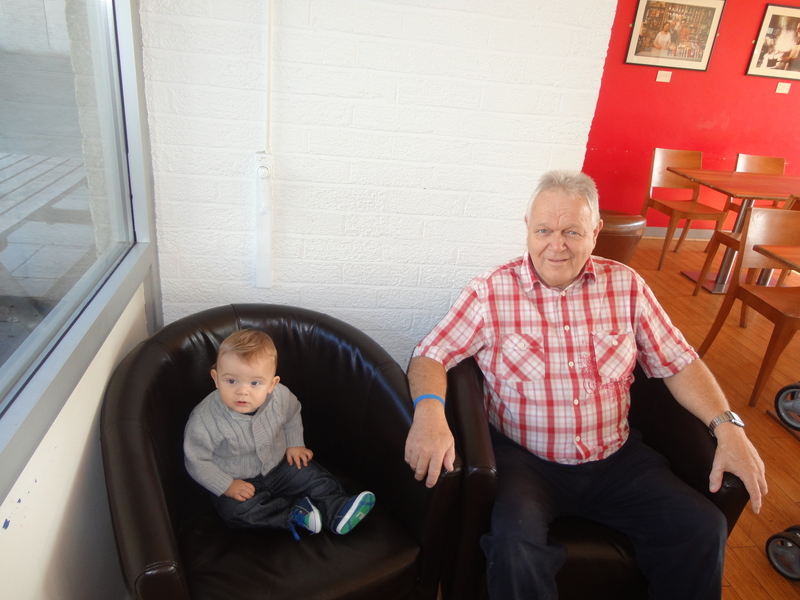 I often think of my family two or three generations down the line, I wonder what they will be like? I went to where I thought the grave was and it was not there. Either the council had moved it or I had forgotten where it was. I thought the former was unlikely. I was so sad that I could not find it. It’s been over a year since I visited it. I was sad and ashamed. I made my mind up to check at home and bring Alfie back one day soon. My grandparents lived in Cowbridge Road West and their house was quite a posh house by Ely standards – no offence meant. It was called ‘The Cedars’ and they had a television long before anybody else I knew. The also had an Anderson Shelter in the back garden, left over from the war. They used it as a coalhouse and we loved playing around it and would occasionally sneak inside and pretend it was wartime, all the while being careful not to touch the coal. It had flowers growing over the top. We loved it! The old house was sold a number of years ago and every time I drive past I remember my childhood and hope the new owners have left that little piece of history in their garden, they could make a fortune by allowing school children to visit! As we drove down St Fagan’s Road more memories of my childhood flooded back. My dad would often drive home from my Nan’s house that way and we would shout, ‘Drive slowly dad… drive slowly dad!’ as we neared the level crossing in St Fagan’s village. We were in heaven if the gates were closed and we would rush out of the car and stand on the old level crossing gates and wait as the train hurtled by and then run back to the car before we caused a traffic jam. No seat belts or children’s seats in those days. Alfie and I arrived at the museum, parked and made our way around this beautiful place. There were adverts around the entrance hall for the Halloween celebrations coming up shortly and I am sure one of the assistants must have thought I had come too early as she asked me to remove my mask as it was frightening the kids, only to walk away rather embarrassed when she realized I wasn’t even wearing a mask. Charming! Alfie just smiled! We stopped at the first house and were immediately told off and informed that pushchairs were not allowed – bearing in mind the place was completely empty. When I questioned why this was so, three dreaded words came back to me… Health and Safety! Somehow I bottled up my anger and parked it outside where it caused a big obstruction and carried the little man in and we settled down by the log fire. Alfie loved it, staring into the flames. He relaxed and was kicking his legs slowly, almost like he was waiting for a story. I thought about telling him The Great Mouse Plot from Boy. I had read the story at the ladies coffee morning two days earlier and the ladies went berserk twice, once when I pulled a fake mouse out of my pocket and waved it in their faces and again when I stopped halfway through the story as I was running out of time. I have never seen them so animated. We chatted to the lady attendant for a bit, she loved Alfie, and then made our way around various other places. 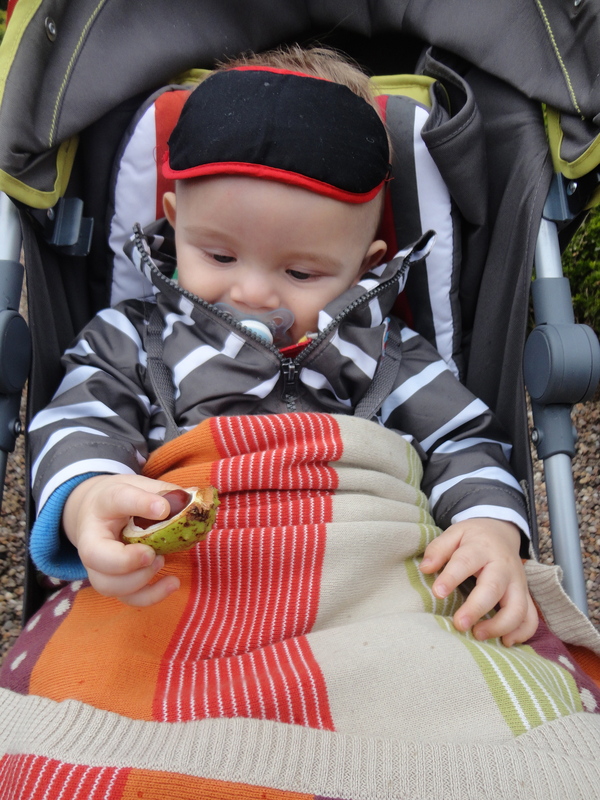 Alfie particularly loved the sheep and the Gwalia Stores but it was lunchtime. We decided to dine in the café by the front door. When we got there, I asked the young chap with a trendy little piece of facial hair, if tea came in a pot or was it a teabag in the cup? I didn’t like his answer so I chose latte; tea must be brewed properly in a teapot. What a common place! 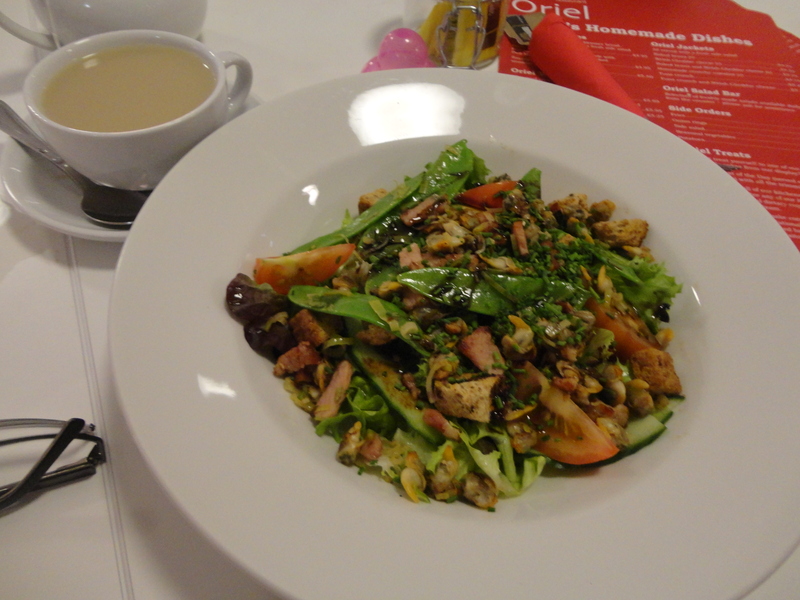 It was quite empty, so we enjoyed a leisurely lunch together. Alfie smiled at every person who sat anywhere near us. As we prepared to leave, I watched several teachers counting their little loved ones back on to the waiting buses and just out of habit I started counting mine…ONE… that’s it, all correct! Good boy Alfie! We then made our way home and as a special treat I took Alfie to the cemetery in St Andrews Major. I let him see the little Bethesda corner where some of my friends are buried. 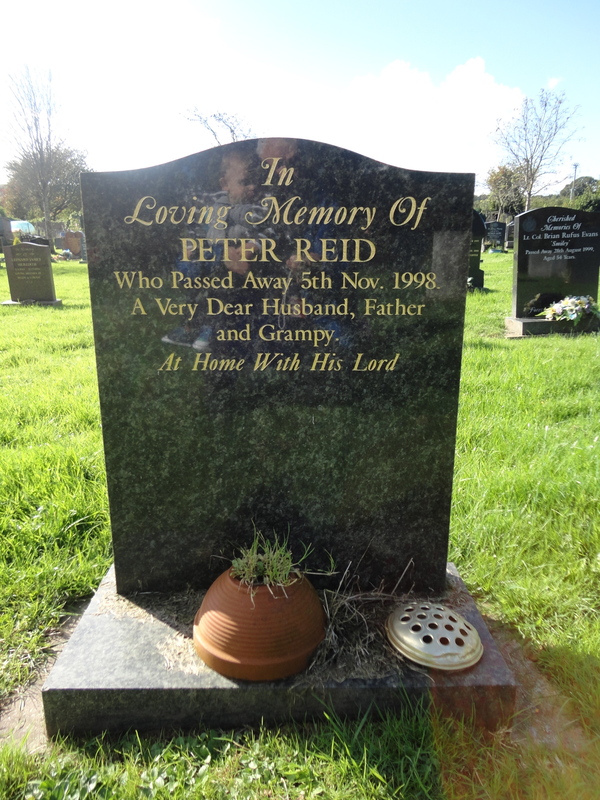 All of these men were good men, Trevor and Bert Davies, Paul Davies, Norman Courtney, Tom and Doris French but it wasn’t until I got to Ken Lewis’s grave and Peter Reid’s grave that I felt a little tear running down my face. We owe so much to these people, who set such a good example for us to follow and helped shape Bethesda into the place it is today. When he can understand, I want Alfie to know about these people and know how important it is to leave the world a better place than it was when we found it. He will need help and I will stand with his parents and do my best to guide him that way… and I am sure the lady of the house will play her part as best she can as well. I drove home; Alfie was quiet in the back. When I put him in for his afternoon snooze, he fell asleep between the front door and the cot. It had been a lovely day. McD’s for breakfast, a cuddle off Uncle Dave Brown, a great play with Mia and Millie, St. Fagan’s and sitting by the log fire with the old timer and now the peace and comfort of the little piece of paradise his nan created for her grandchildren. I listened carefully…and yes the wind had died down. The lady of the house will be so pleased! The speech delivered on behalf of my family at the Diamond Wedding Anniversary of our parents on 29th June 2006. 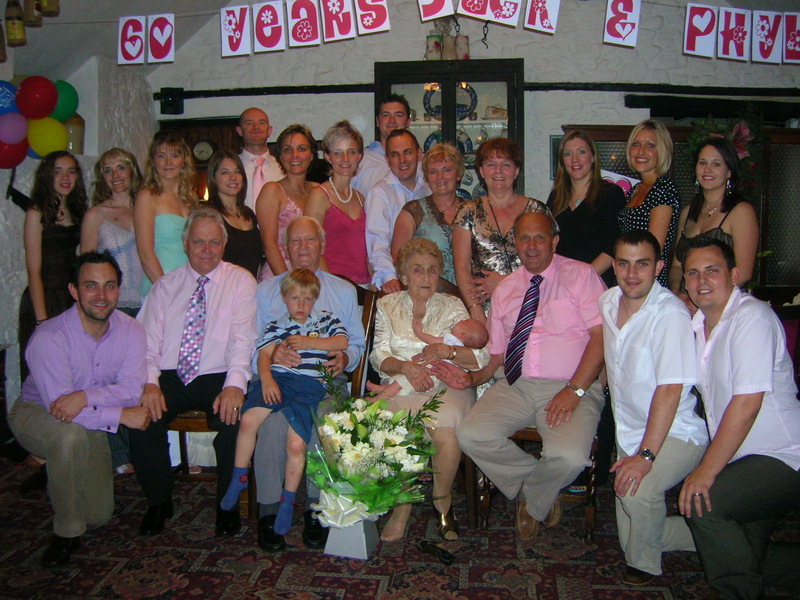 The celebration was held at The Farmer’s Daughter Restaurant in Bassaleg, near Newport. So let’s do that now!! It’s hard to put into words the feelings of our hearts today. 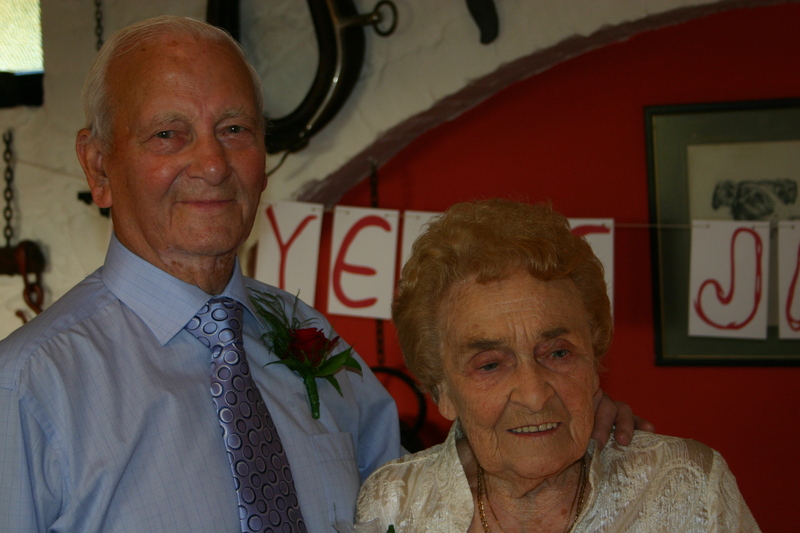 60 years of marriage is a remarkable achievement and we are here to honour you for it tonight. Dad and mum , we as a family, want to thank you for being the most remarkable parents. The fact that your love has, day after day continued to grow and that we your family are not just family but best friends and are probably closer now than we have ever been, speaks volumes about the example that you have set for us to follow. Tonight, John, Joy and I feel like Sir Isaac Newton as we are doing just that and now as our children, your grandchildren, begin to have families of their own, we see again the importance of the solid foundations your love has given us and impact that your love has had upon all our lives. When you leave this earthly scene, be assured that the influence of the love you share with each other will continue to be felt in the lives of our children and our children’s children and their children in turn. Growing up in your care has been the most wonderful experience for us. 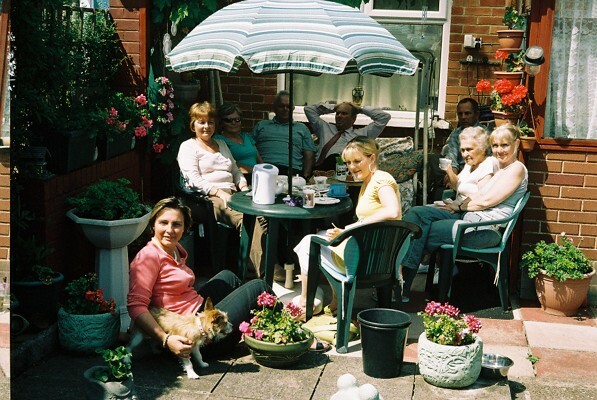 Life in our home in Llanishen was idyllic. We had a mum who devoted herself to looking after us and our home, a dad who worked so hard for his family. A man who cycled home on his bike, with handlebars laden with off-cuts of wood for the fire. 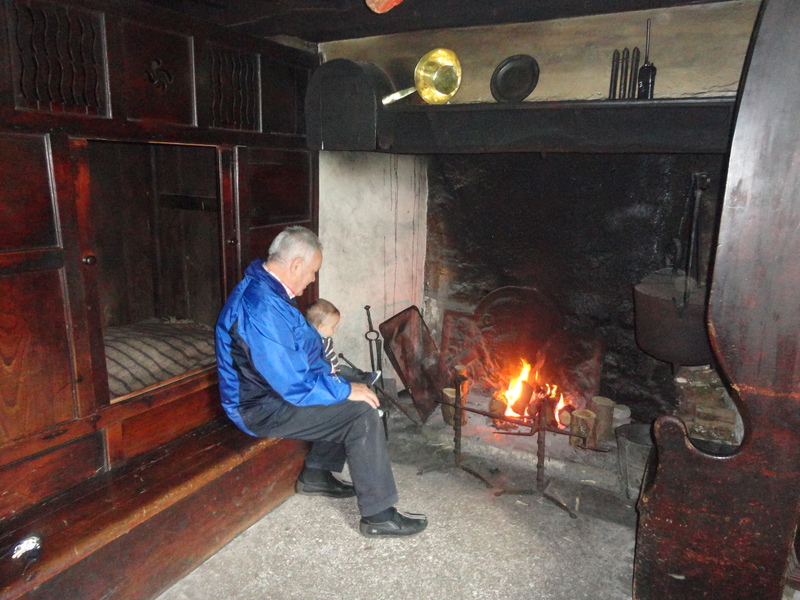 As very young children we would await his call of ….’Dad’s home’… before running to meet the wonderful man who was our father and be cuddled by his rough carpenter’s hands! 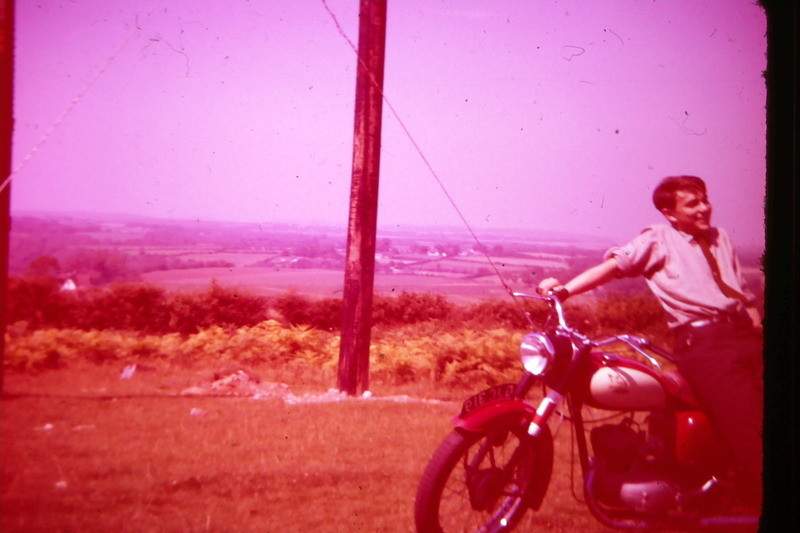 We had many happy days of excitement, like the day dad bought his first motorbike – a B.S.A. Bantam, registration number FBO 717, or our first car a little green ‘Sit up and beg’ Ford Anglia, MTX 292, which couldn’t get up Caerphilly mountain! 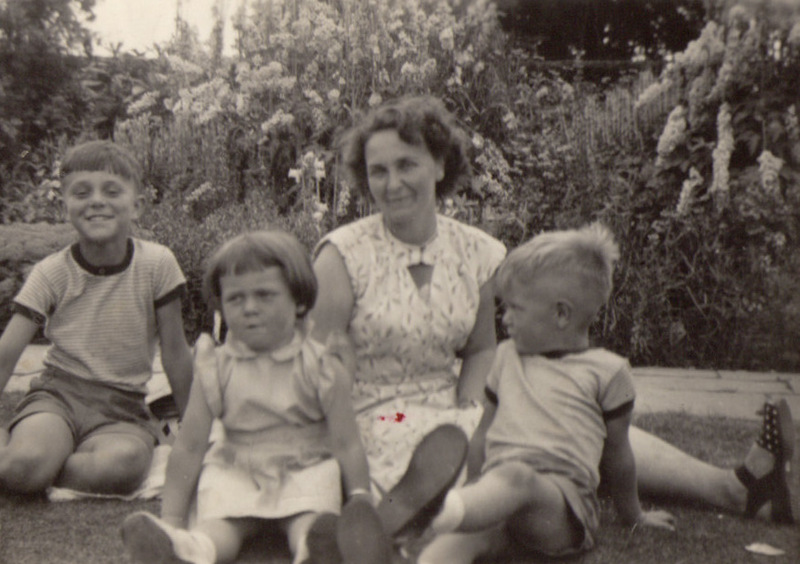 We had many friends, a safe street in which to play, the woods and fields nearby and at the end of the day, we came back to the security of a home filled with love and care and a dad and mum who so obviously loved each other and loved us with a passion. A willingness to support us in whatever we tried to do! We also look back with affection at our extended family – our church family. Many from the church are here tonight to share this special celebration. 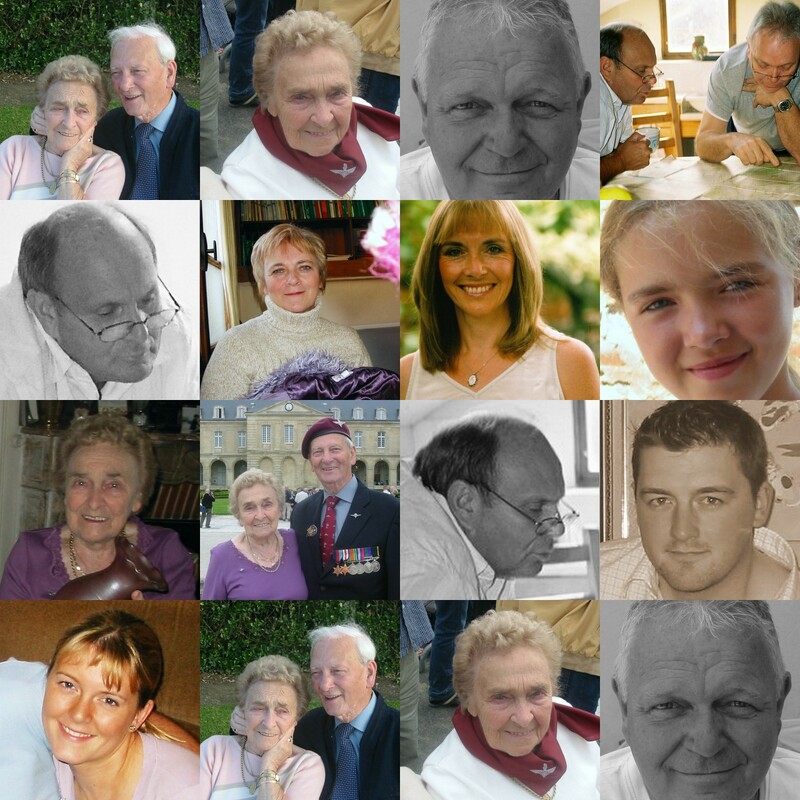 Thank you all for the special part you have had to play in the lives of my dad and mum and in our lives too. 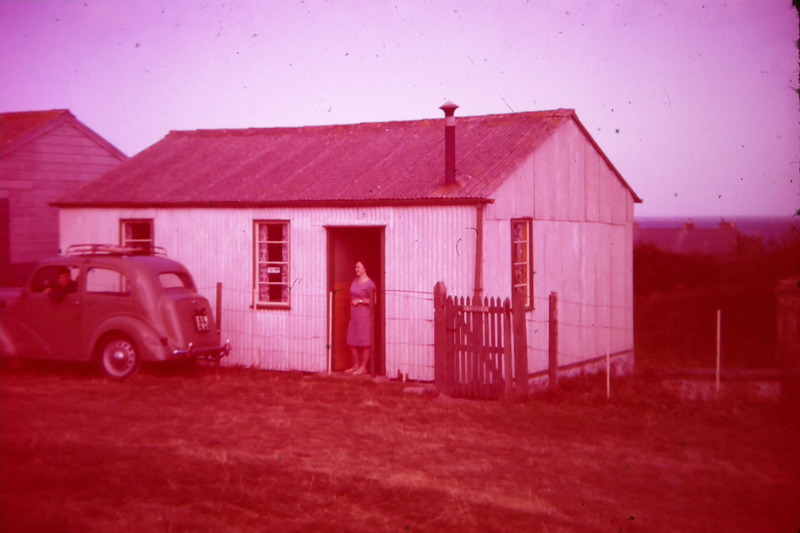 Those early pioneering days were very special and many happy friendships were made, Gordon Trew, The Throwers, Aubrey and Lilian Roberts, Bill and Ruby Dobbs, Charles and Eileen Hallet, Jim and Ruby Orr, Billy and Gladys Williams and Shaun Ryan… Our home was constantly open to the young people of the church and many nights were spent singing and having fun. But for one young man in particular our home became his home. We ‘adopted’ a young man named Paul Pace. He was a young lad from a broken home on the other Llanishen estate. He became like a son to you and a brother to us. Marriage is a beautiful picture of the relationship between Christ and His church. I always tell the happy couple what this means in reality is that when we model our marriage on Christ’s love, that the bride needs to love her new husband enough to live completely for him and the groom needs to love his wife enough to die for her just as Christ died for the church. Dad and mum, you are the best examples of that love we have ever seen! We love you so much and pray that you may you have many more years to enjoy your special love together. May God richly bless you both. This experience is the ideal example of brotherly love. In the verse from The Bible above, it is this love between brothers, and sisters that we are encouraged to weave into the fabric of our Christian relationships. I love my brother dearly, his name is John and he is just over three years older than me. He is a wonderful brother who has looked out for me from the day I was born. Growing up, he always looked after me and I always looked up to him and I still do to this day. I often describe our childhood as idyllic. We grew up in a simple way, in very special home. 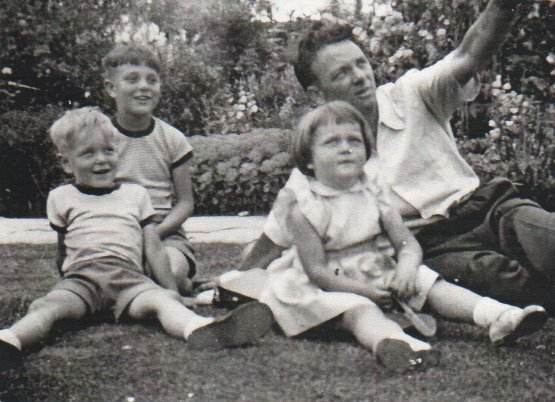 We grew up in the fifties, shortly after the war and life seemed so much more simple then. We spent many happy holidays with parents who loved us and made sacrifices every year so we could always enjoy a family holiday. One special place we often went to was Broadhaven in West Wales. My brother and I enjoyed these times. Sometimes it was just us, often it was with a friend who just happened to tag along. This photograph shows the chalet we often rented near the sea in Broadhaven, complete with oil lamps for our light. 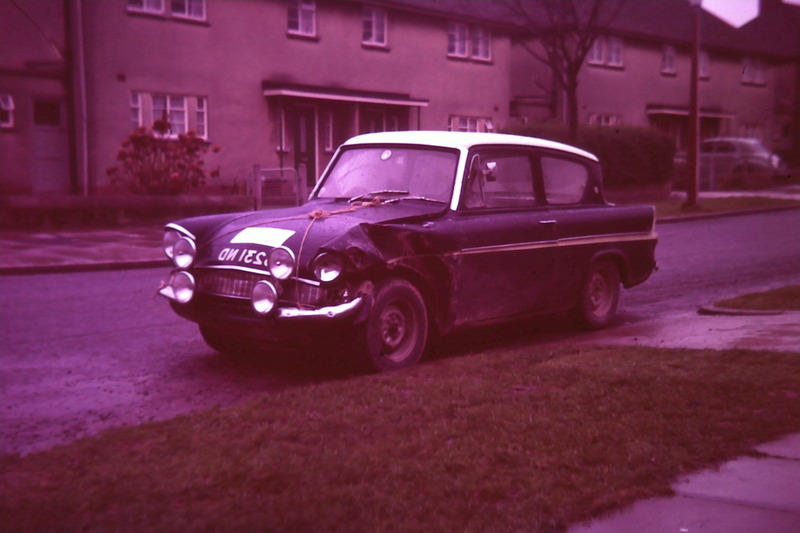 The picture shows our very first family car, a Ford Anglia. My brother always was and always will be my hero. He was always doing things that I wanted to do. 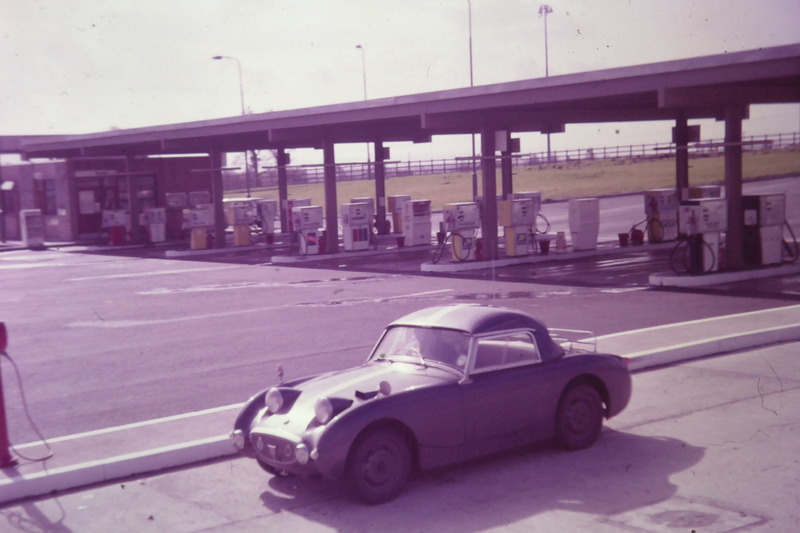 He had a motorbike and a huge number of cars, always different; there was a Land Rover, an Austin Healy ‘frog-eyed’ Sprite, which he painted blue and put a thick white line across it and many others. I was always the quiet one and I often longed to be like him, full of spirit and adventure, which often got him into some kind of bother but nothing could diminish his love of life and his wild imagination. When we were growing up we were part of a large group of youngsters who attended our local church. They were great days full of laughter and fun. He had a range of jobs after he left school. 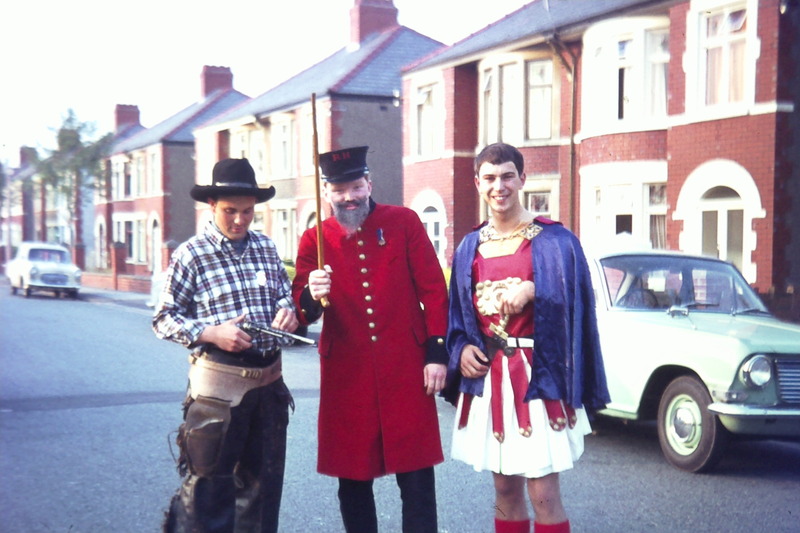 He was a sales assistant in Evan Roberts, a big shop in the centre of Cardiff, where he would often go wearing a bowler hat; he was a farmer for a while, out in all kinds of weathers. He was a representative for a sweet firm called Batgers and a toy manufacturer, both of these meant a company car. He was also some kind of fitter/mechanic for Roneo Neopost, which meant a grey company mini van and I had countless rides in it and loved every one. It was while he was working for Roneo, visiting a company to repair their franking machine, that he met a young office girl who he eventually married. Chris has become not only my sister in law but one of my very best friends. When they got married, my brother asked me to be his best man. I was still quiet in those days and the whole experience terrified me, but I had to do it because I loved him so much. It soon became apparent that he was only really happy when he was his own boss and he was brave enough to become a real entrepreneur. I’m not sure what Alan Sugar would have made of him, but wherever he went and whatever he did, he worked extremely hard to provide for his family. He got me involved in most of his businesses, often just to help me out when times were tough. 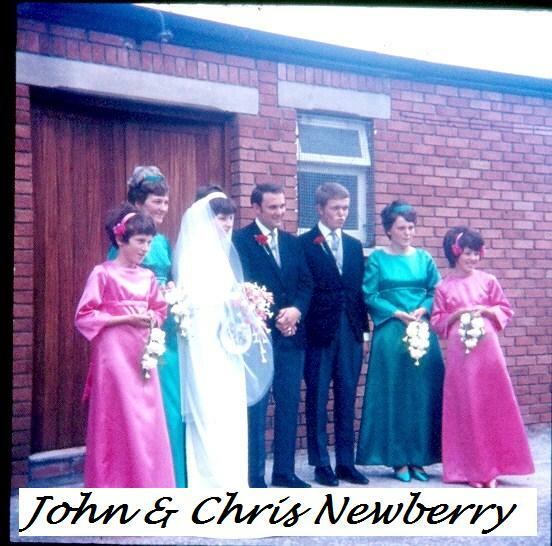 When Jean and I got married, we bought a bungalow just a few doors away from him and Chris. They were happy days. 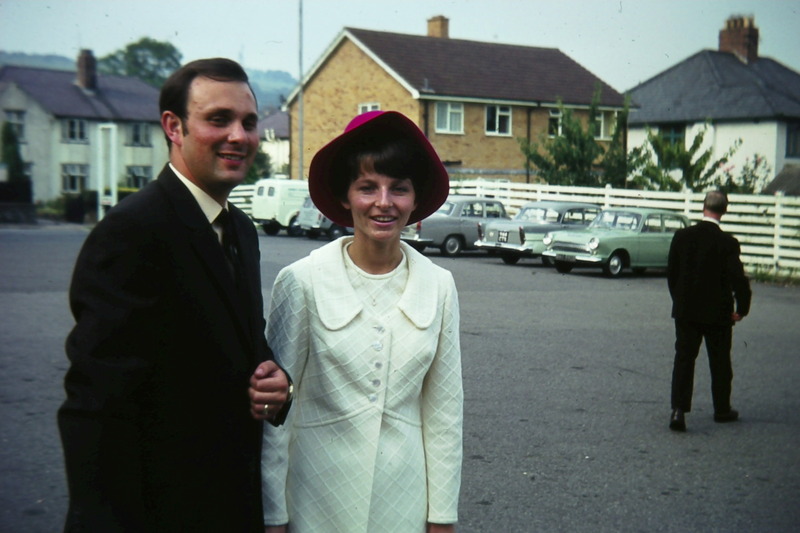 Jean and I cleaned cars when we were newly married. I was a teacher and part time car cleaner for John Newberry Car Sales, an office worker and driver in Merthyr Motor Auctions and South Wales Motor Auctions. 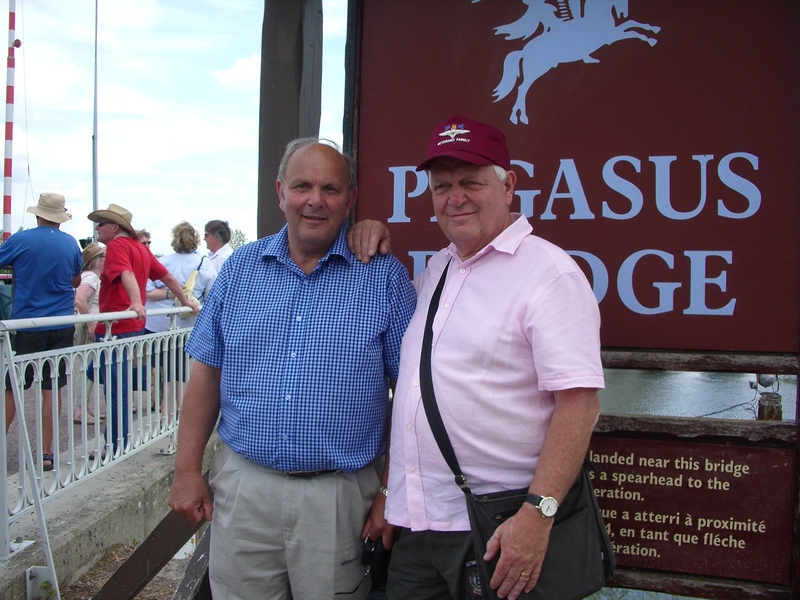 Health and Safety prevented me from being a driver with Pegasus Travel, although much to Danny’s annoyance I did get the Pegasus jacket. He is, without any doubt at all, one of life’s real characters and has one of the kindest hearts I know. When he picks up customers from the airport as part of his chauffeuring business, he always checks that they have bread and milk and will often divert to make sure they have all they need. People love him. 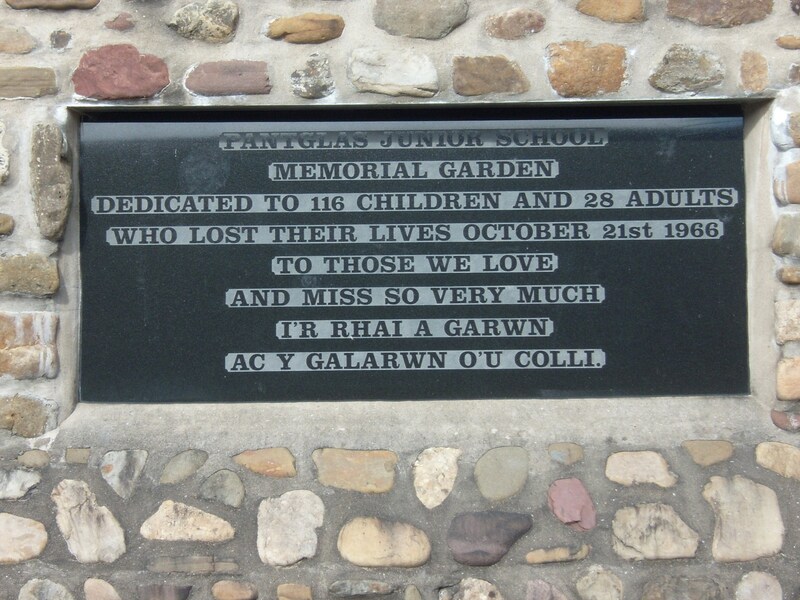 One of the clearest ways he showed his caring nature was on 21st October 1966, it was my birthday and we were celebrating, when we heard news of the Aberfan disaster. A coal tip had slid down a mountainside and engulfed a small school in the Rhondda Valley. Without a second thought he said that he was going to help and he and I travelled to Aberfan to assist in the rescue mission. Dad and mum followed in their car but they were turned back. John, as only he can, managed to talk his way past several police road blocks and we spent several harrowing hours carrying buckets of coal slurry as the bodies of the victims were recovered. It was a night that will be with me forever. Often, he puts on a show of being fed up and pretending that he hates a fuss, but he has never fooled me, I know him to be a kind, caring man who loves his family and will help anybody who is in need. 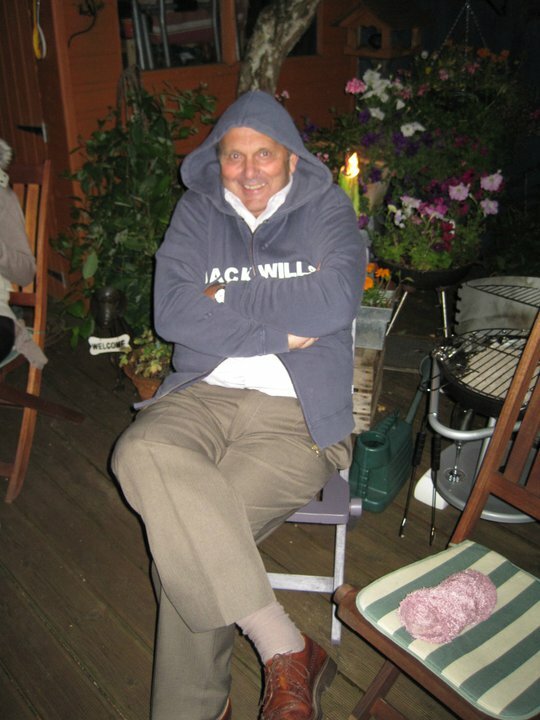 Never did he show his loving and caring side more than the way he looked after my parents. Words cannot describe how good he was. I was often busy with church and school and looking back, I can see how good my brother was. He would ring every day to make sure they were OK and had all they needed. 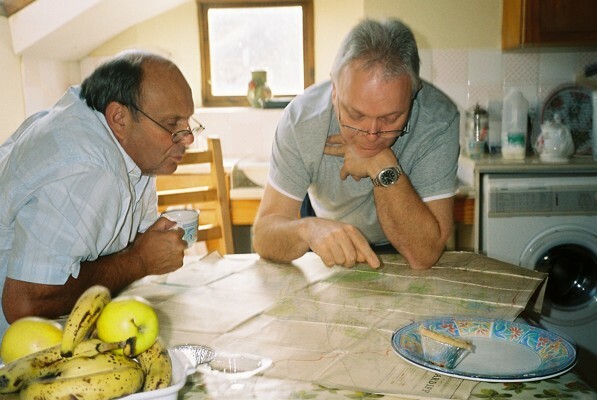 He would always drop in to check on them and on a Saturday when the whole family called to be together, my brother was always there – often with his own special little treat from our mum. He was special to them and played his part as the oldest child of the family wonderfully well. 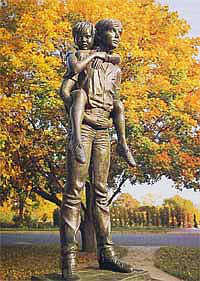 He was the one who was always available when they needed a lift to the hospital or some other appointment. I will always be in his debt. 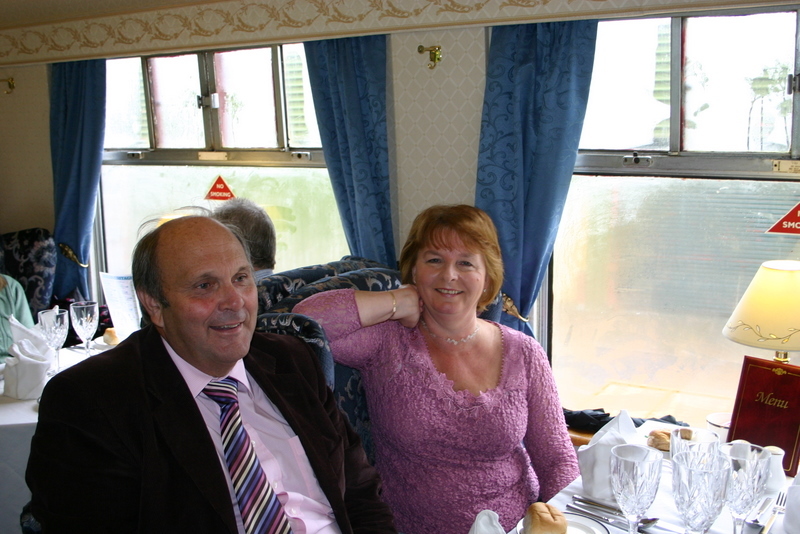 He arranged day trips for them, days which they loved and treasured, especially when there was a meal and a train involved!! I will always be grateful that when our dear father passed away it was my brother who was holding his hand. It was my brother who rang me when I was on holiday in Canada to tell me of our dad’s passing, he was so kind and gentle as he told me. I just fell to my knees and wept in a car park in Kelowna, holding a public telephone and needed a hug from him more than ever that day, but he seemed so far away. It makes no difference whether they are old or young, my brother loves people.He is never happier than when he is playing with the kids. 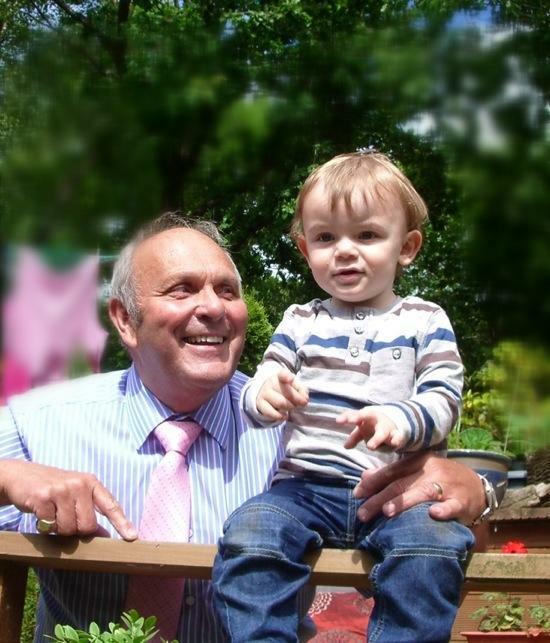 I recently took my grandson Alfie on a visit, the two of them got on like a house on fire, Alfie genuinely took to him like an old friend, thanks mainly to John’s kind, caring nature. 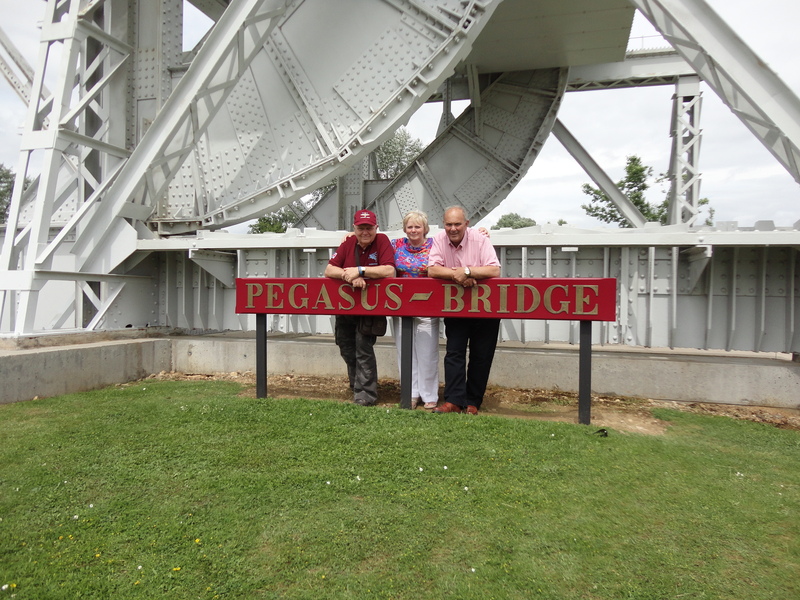 In recent years my brother and I have made several trips to Normandy to visit Pegasus Bridge. 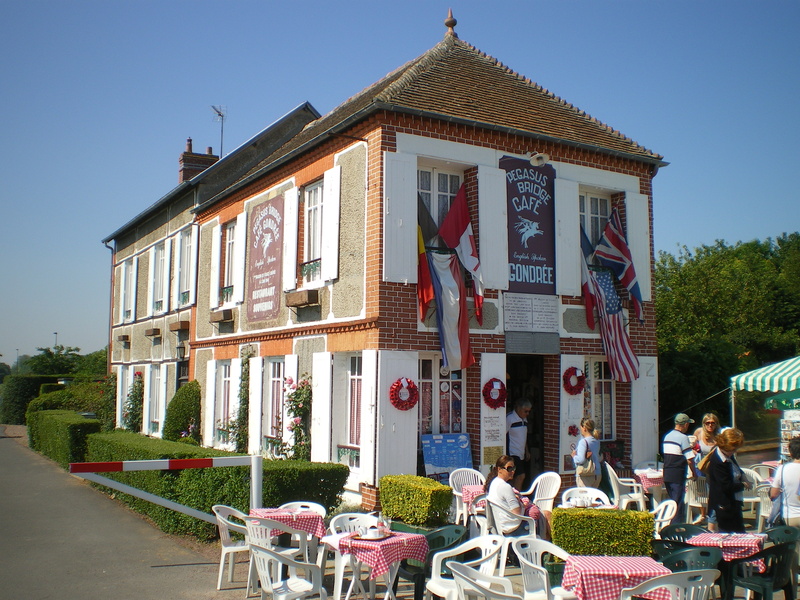 On D.Day 6th June 1944, my father was dropped in by parachute near Pegasus Bridge and helped liberate France. It was a secret he kept for many years until just before the 60th Anniversary, when my family took him over to France to receive a special medal. Sadly John and Chris were unable to come on that occasion, but we have since made several visits back to Benouville to pay our respects. 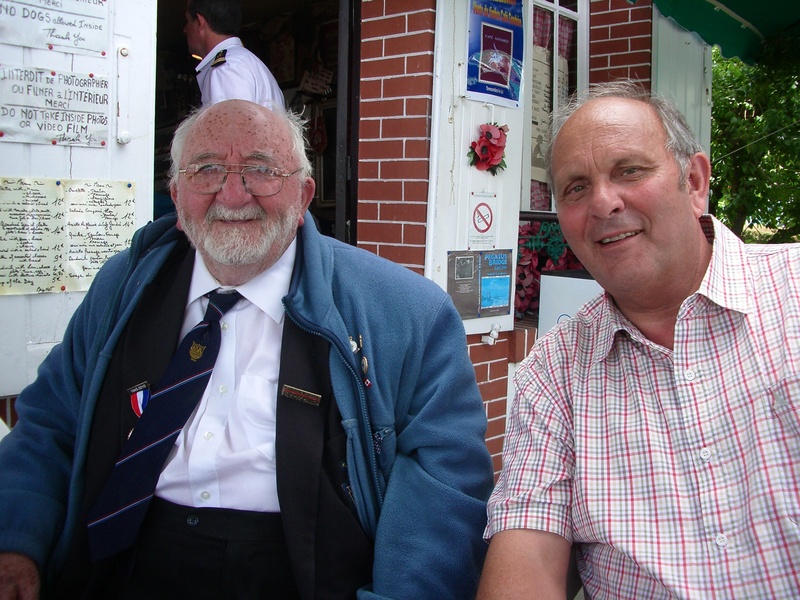 My brother’s natural ability to talk to people meant that on one visit we befriended an old soldier named Joe Riley, and we now often keep in touch with old Joe and meet up with him at The Cafe Gondree near the bridge each time we visit. With a friend, it’s a shared experience, with a parent, shared heritage, with a mate , shared love. But with a brother it’s all of these ….and more…even a troublesome nail. I came across this picture last weekend. I think it’s a simple but powerful reminder of what we can be to one another if we just thought about it. I am so very grateful for my friends who have helped and supported me through the tough times in my life. 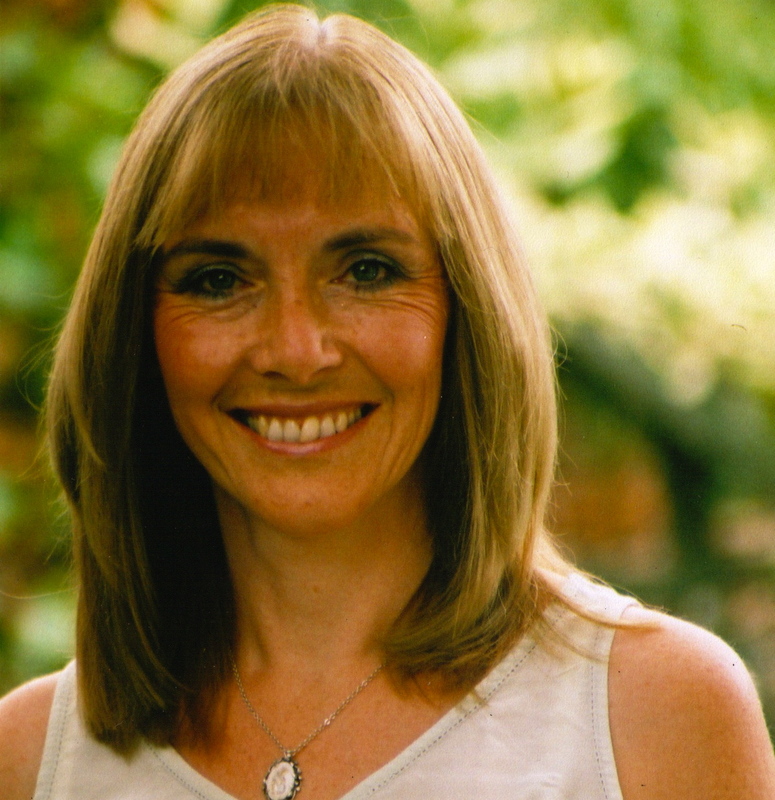 I remember those who helped when Jean had her miscarriages, those who supported us so well when dad and mum died . Losing my father while I was in Canada, miles away from my family was horrible, but I could not have been with nicer friends who were wonderful to me and helped me all they could. They knew when I needed to be alone and when I needed company and a chat! Losing my mother so soon after was almost too much to bear but we were surrounded by people who cared and wanted to ease the load. When I was in hospital last year there were those who brought us meals and came and tidied the house. Bearing one another’s burdens is a vital part of all of our lives but as Christians we have a great responsibility to see the need in others and reach out in love and support them. Thank you to all those who have helped bear my burdens, you have inspired me to go out and make the world a better place. As I drive past the local Infants School I always look up at the school motto above the door. It says, ‘Nid Byd, Byd Heb Gwybodaeth’, which literally means a world with no knowledge is no world. One day this school will be Alfie’s school. One thing I must try to do in my Friday Adventures is do my bit to prepare him for the time when he leaves the safety of family and enters the world of education. 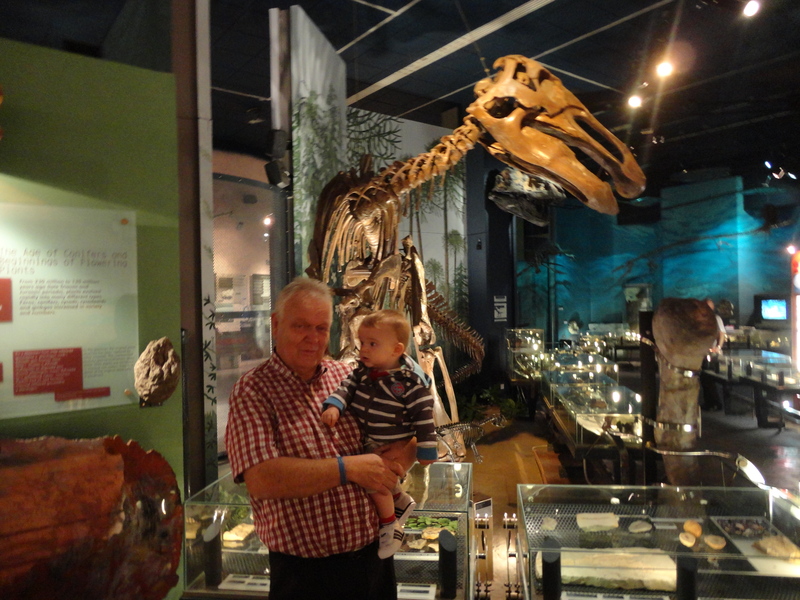 With this in mind and reflecting that we spent last week in Barry, Alfie and I decided this week we would up our game and head for a place of great learning…Yr Amgueddfa Genedlaethol Cymru…The National Museum of Wales. Alfie stayed overnight so we had another nice early start. 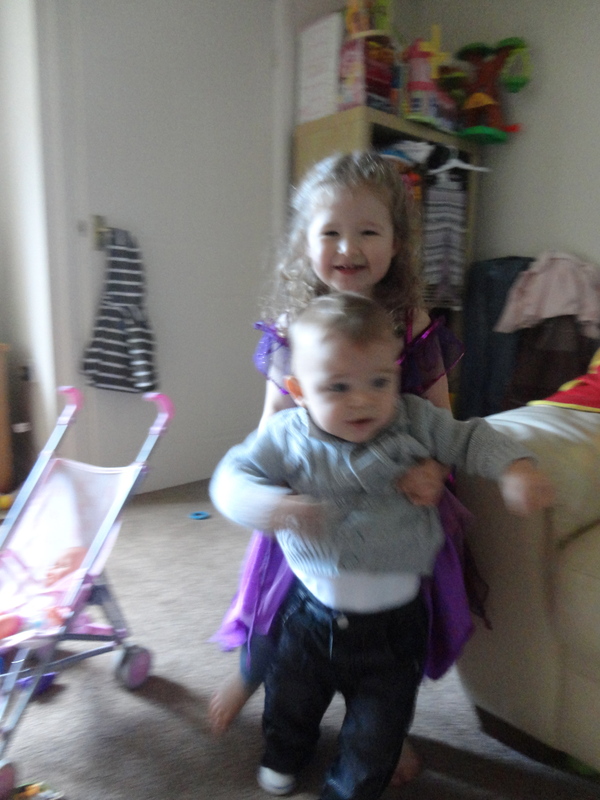 The lady of the house, bless her was up early dressing Alfie and preparing him for the day. I gave him his breakfast of Weetabix and mashed banana and as my car is off the road, the lovely lady had to walk to work, so Alfie and I had an extended playing time before his morning nap. We had a lovely time. 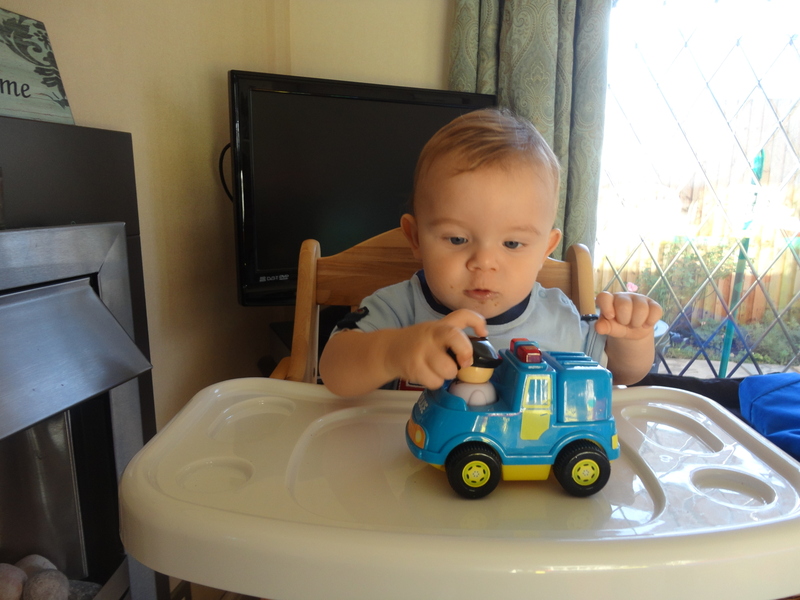 It appears Alfie has two favourite toys in his toy box; a police car that makes a great siren noise and an old plastic Quality Street jar. The sweets have long left the jar and are resting comfortably on my waistline and the hips of the lady of the house, but the jar retains a strange fascination for Alfie. 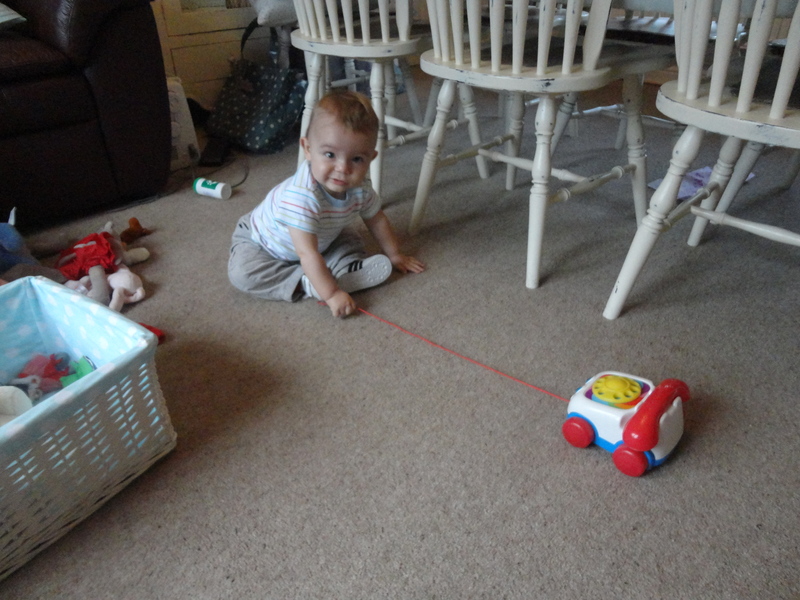 We also had fun with an old Fisher Price toy we picked up in a car boot sale at Bessemer Road in recent weeks. It’s a kind of pull along telephone and when you pull it its eyes pop up and down. I think it appeared in a Toy Story Film. Alfie really got the hang of pulling the string to make the eyes go…he had a fit of the giggles. While we were playing I was fascinated at Alfie’s ability to blow snot bubbles from his nose with effortless ease, almost without trying! 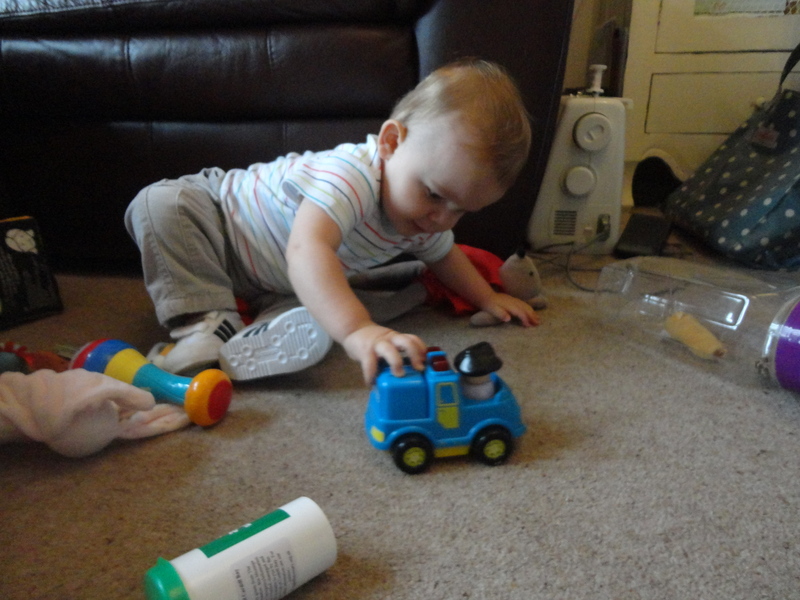 He is teething and has the sniffles, that’s a common enough occurrence but snot bubbles is something else! Alfie had a little sleep then and I wondered if he could blow snot bubbles in his sleep. It might be possible. After his nap, we prepared for the day. A free day thanks to the Welsh Assembly Government who give free travel to the old and infirm; thankfully I am one of the former and they have also abolished entry charges to museums. Cool! My car has broken down so it meant the bus or the train. I went for the train thinking I had just missed a bus, but when I reached Cardiff Road, there was a huge queue of traffic, so I guessed the bus may be late, so I went to the bus stop and, great timing, the bus arrived almost immediately. I catch the good old number 95 into town. I was a bit panicky, as it will only take one pushchair unfolded, so if there is already one on board you have to remove your little darling and fold the blessed thing up, then you have no chance of reading The Metro. I held my breath, but thankfully all the young Barry mums were probably having a lie in or still watching Jeremy Kyle on ITV +1. The bus bounced its way into Cardiff and we got off at The Central Bus Station. As usual every human being within a five-seat radius of Alfie was captivated by his smile and he had the whole bus almost paying him compliments. Happy days! It’s a fair walk from the bus station to the museum, so I gave Alfie the opportunity to have a look at some of Cardiff’s old arcades on the way. I am sure he loved them; we walked up the Wyndham Arcade down the Royal Arcade, up the Morgan Arcade, then across by the Hayes Island Snack Bar. I thought the pushchair had developed a fault, as it started pulling to the left as I went past, but I kept thinking of bacon rolls and seagulls and forced the pushchair on. As we passed by the fault seemed top correct itself…strange that. As we went through the subway in front of The City Hall we stopped to hear a busking accordion player. Alfie loved the music and was fascinated by the way the man’s fingers skipped over the notes. He looked quite poor and a few of the notes near the top end were missing or all buckled. I was looking round for a seat. I love to hear music being played in the street; those Peruvian singers are my favourite. The guy smiled and started to chat. He asked Alfie’s age, Alfie was smiling away in time to the music. 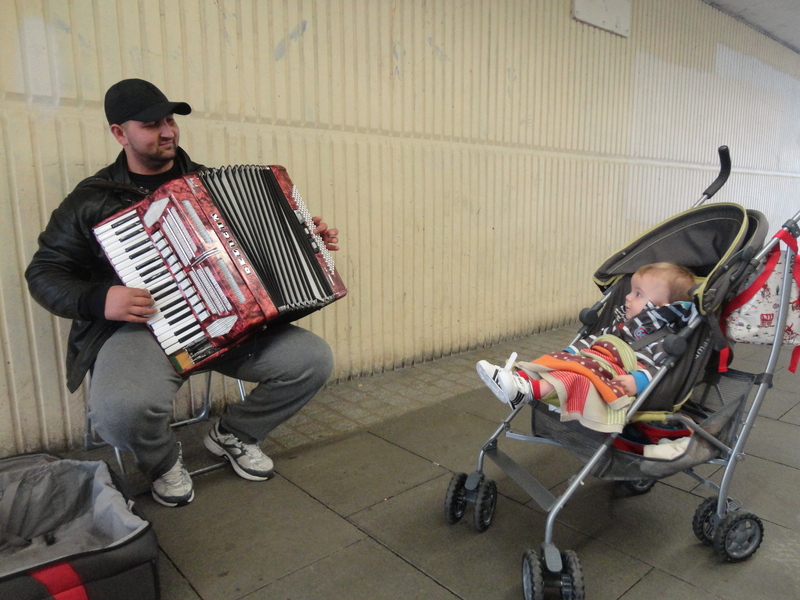 Turns out this Eastern European accordionist had four boys of his own; the youngest just about Alfie’s age. I gave Alfie a pound to drop in his case, but he tried to eat it, so I had to do it myself. You meet some nice people. He smiled and thought about his boys back in Eastern Europe and his dream of opening up a car wash in Tesco Car Park…he was a pound nearer to achieving that particular dream anyway. We strolled on. I was thinking that I hope that as Alfie grows up he has a good heart and cares for those less fortunate than he is. 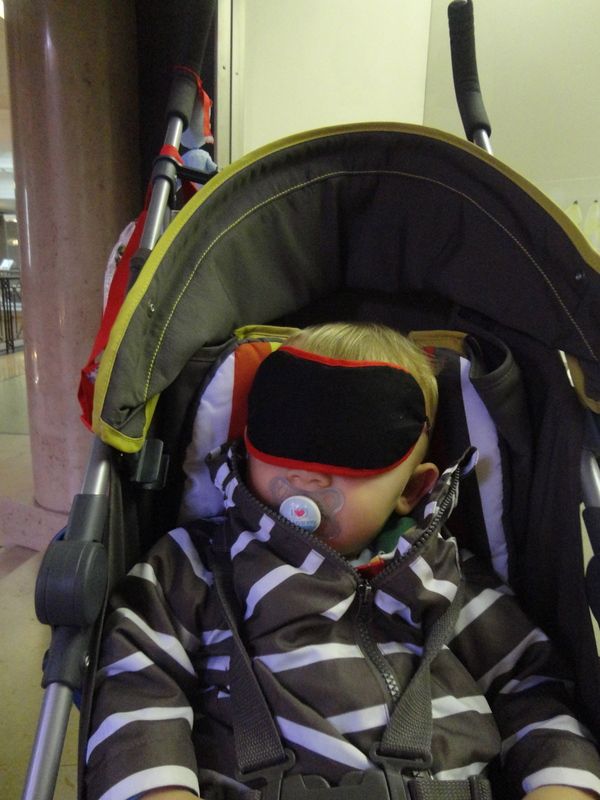 Before we entered the museum, I put Alfie’s mask on him. 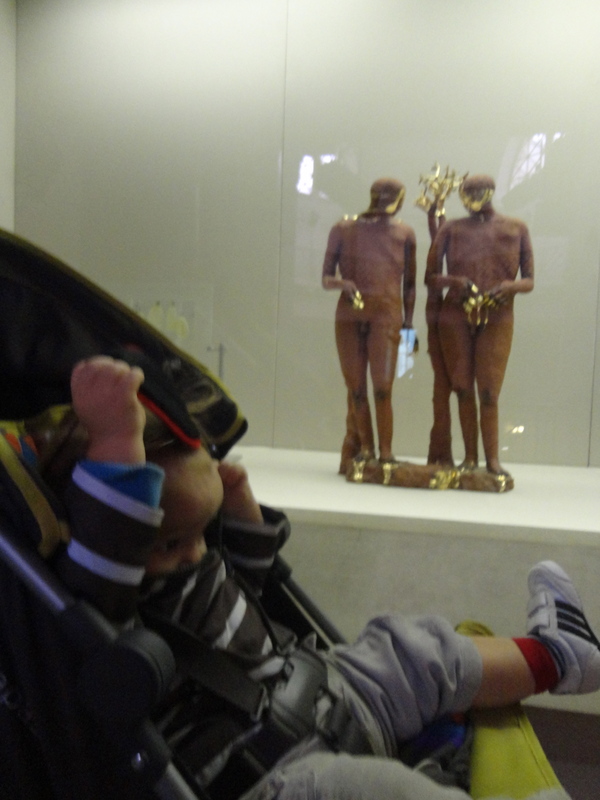 As a responsible and caring adult I knew that some of the statues in the museum had a habit of showing their bits and I consider Alfie too young for such things. Unless care is taken, he will grow up like his mum and grandmother. I remembered the time in Florence, that great city of culture, when the lady of the house came face to face with Michelangelo’s statue of David and giggled uncontrollably. Or the time the great lady and Alfie’s mum watched the ballet in the Wales Millennium Centre and were threatened with expulsion because of the sniggers every time the male ballet dancers flounced on to the stage. He wasn’t terribly keen on the mask, but I knew it was for the best! 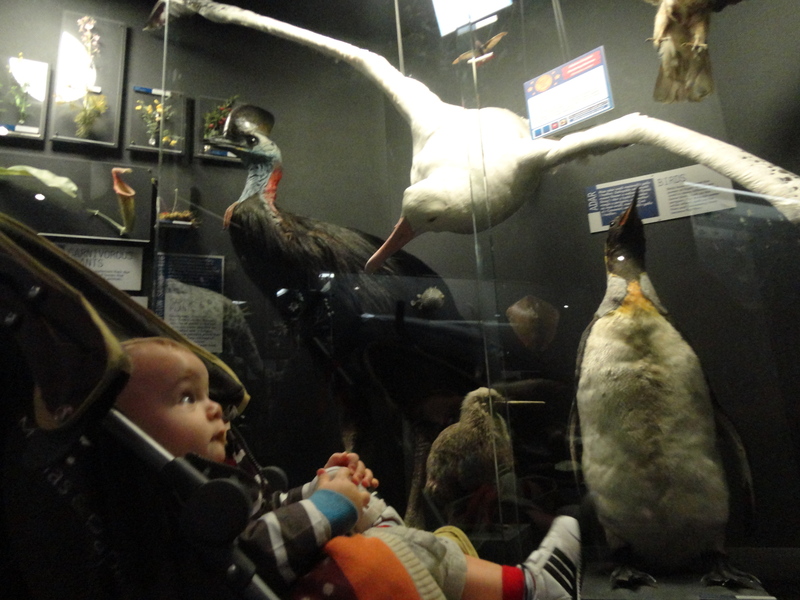 Alfie and I did the natural world section first and boy did we have a good time. Buffalo, dinosaurs and all manner of strange beasts were on display. Alfie was fascinated! 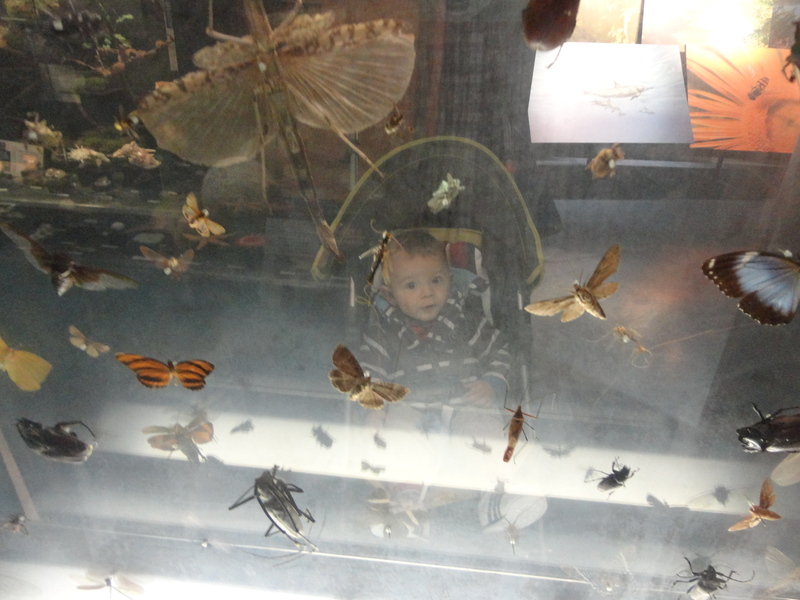 He particularly liked the moths and butterflies, unlike his aunt Bes who screams loudly at anything that has more than two legs and can climb up walls. From here we moved on to a display of Welsh ceramics and both dozed off, whilst walking around! Not all that interesting but at least no statues…. We decided to take the lift up to the next floor and quite unexpectedly the lift took us up to a café, that’s all that seemed to be on that floor. Still it was nearly dinnertime. I looked at Alfie, Alfie looked at me and we both nodded and agreed to stop for luncheon. 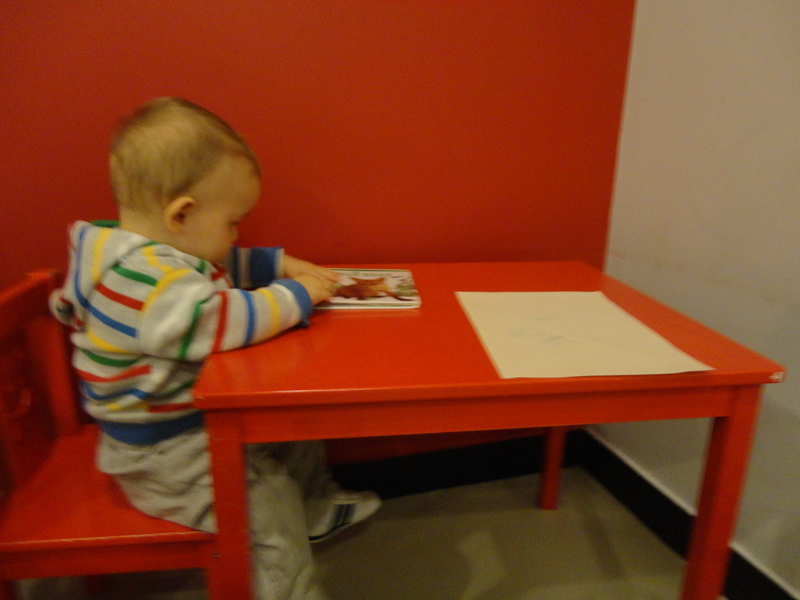 It was a cool place with plenty of high chairs and a parents and baby changing room. There was also a kids playing area so I had all I needed. I set about feeding Alfie. I had prepared cheese sandwiches on white bread with extra mature cheddar followed by a fruit pot. He really enjoyed his lunch and consumed every bit. While he was eating, I looked at the menu and my eyes came across…warm salad with hot Penclawdd cockles, bacon and mangetouts. I gave into the temptation and ordered it with a pot of fair-trade tea. Heaven! They gave me a Welsh love spoon with the number 5 on it for my table to guide the waiter. Alfie loved it! He played drums on his high chair and amused all who were sitting around him. When my meal came they must have run out of mangetouts as they just gave me some pea cases instead. When I was a kid I used to love shelling peas for my mum, but eat the empty pea cases never! I didn’t feel like arguing so I just ate it. Words cannot describe how good it was. Alfie kept eyeing up my cockles, but much as I love him…there was not a chance of me sharing them. 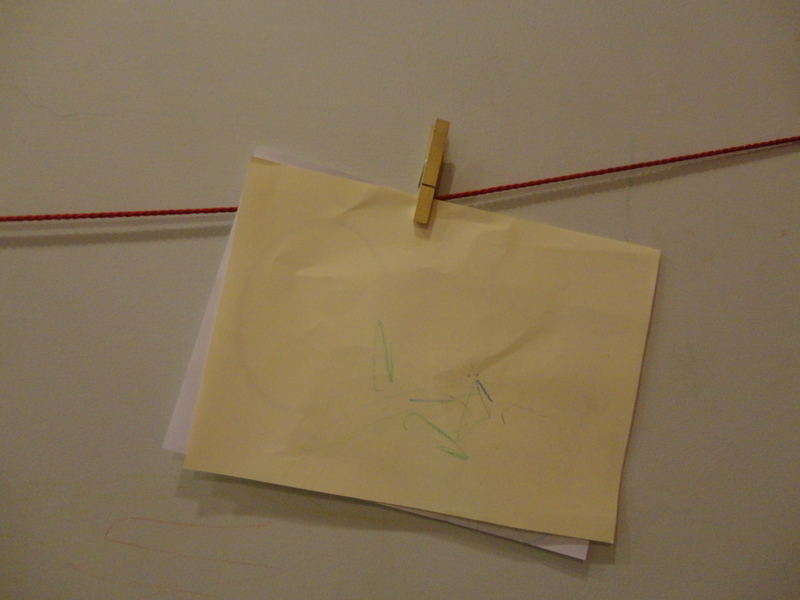 After food we went to the play area, where I let Alfie draw a picture. He seemed to think that the crayons were edible and we had this massive fight to keep each one from his mouth. On the way to the exit, we walked through various galleries and the event I had been dreading happened. Luckily I was able to pull Alfie’s mask down in the nick of time. Oh the shame of it, how could they stand there on their plinths with everything on show!! Alfie kept trying to pull the mask up but I knew what was best and kept pulling it down. 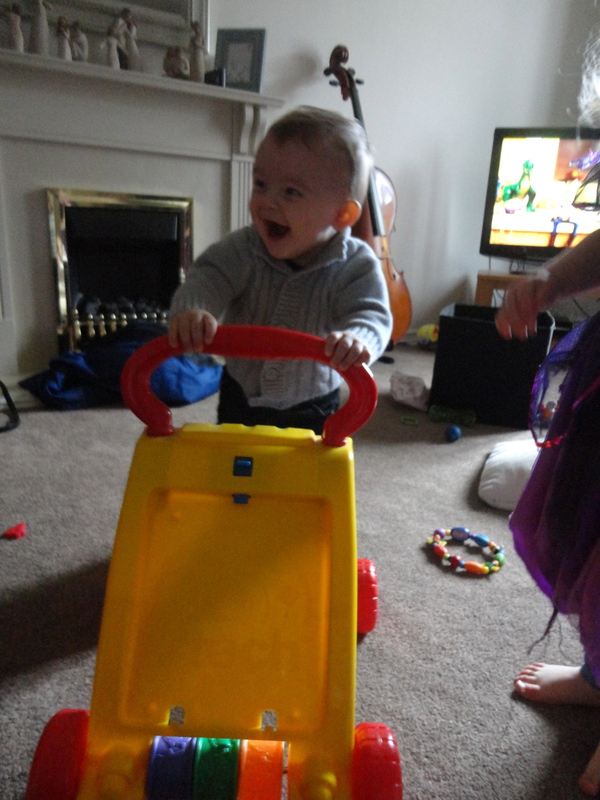 I changed gear on the pushchair and beat a hasty retreat and reached the front door without any further embarrassment. We walked back to town through the Gorsedd Gardens. These are right in front of the National Museum; these small gardens are an attractive place to walk. There are many well looked after flowerbeds, which are attractive throughout most of the year. There is a stone ‘druidic’ circle dating from 1899 when the National Eisteddfod of Wales was held in the city. From here we walked across to the Earl of Windsor Garden. This is a quirky little garden just opposite the castle. It contains a statue of the Earl of Windsor… not really sure who he was! I took Alfie there because I could see a conker tree. We only found a few despite there being hundreds of empty shells. I explained the rules of conkers to Alfie, who was only desperate to eat them. He didn’t seem to appreciate anything about conkers or strings or what was a sixer or a tenner or a twelvesey. I saved the explanations of how some people claim to make a conker a champion by baking in the oven or soaking it in vinegar for another day. It’s a foul practice only undertaken by people who don’t appreciate the finer points of the sport. Alfie was getting tired! We made our way back to the bus station to catch the number 95 back home. Luckily I was again the only pushchair on the bus, which was very crowded. This very large lady perched herself on the seat next to mine. She was lovely with my little man and Alfie smiled at her all the way home, now older and wiser as a result of his day in the museum, learning about the natural world, how rude some statues are, the Gorsedd Circle and above all else how to play conkers! This poem was the favourite of my dear parents. It sustained them through the dark days of World War 2, when my father was fighting in Europe and then throughout their married life. It always appeared in letters and cards down through the years. 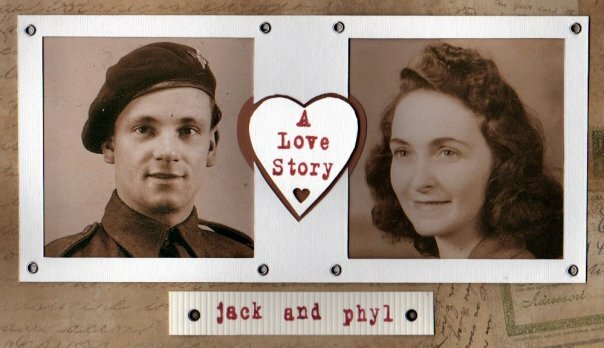 When they passed away, we came across their love letters and they are now among my most treasured possessions. The poem is quoted on their gravestone. The love they shared was in many ways unique and reflected their strong Christian beliefs. The ways they showed their love for each other and their family is a constant source of inspiration to me. I miss them each and every day of my life. I really believe they love each other perfectly now, just as the poem says.